Zimbabwe's central bank has announced that three zeros will be taken off every banknote to help consumers deal with inflation of almost 1,200%. Central bank governor Gideon Gono said Zimbabweans had three weeks to exchange existing banknotes for a new series being issued from this Tuesday. Mr Gono said people had experienced enormous inconvenience because of banknotes with too many zeros. Mr Gono also announced what amounted to a 60% devaluation of the currency. The new official exchange rate will be 250 Zimbabwe dollars - 250,000 of the old Zimbabwe dollars - to the US dollar, as opposed to the previous rate of 101,000 to one. However, foreign currency fetches at least four times this amount on the parallel market. Economists said the removal of zeroes in itself did not amount to a revaluation, but was simply aimed at making it easier for people handling increasingly unwieldy wads of banknotes as inflation soars. Zimbabwe has been issuing so-called bearer cheques in recent months, with increasingly high face values. Notes to the value of 50,000 and then 100,000 Zimbabwe dollars have appeared since the beginning of the year. 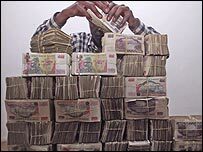 The bills are known as bearer cheques since they are promissory notes rather than official legal tender, but are used in Zimbabwe in the same way as money. The government has announced a National Economic Development Priority Programme (NEDPP) in order to deal with the economic problems. Zimbabwe is suffering from shortages of food, fuel and foreign currency. In April, inflation passed 1,000% per annum for the first time. President Robert Mugabe blames domestic and foreign enemies for the problems, while his critics point to the collapse of agricultural exports following a controversial land reform programme. The country is struggling to pay civil servants and is thought to owe money to neighbours such as South Africa and Mozambique from whom it has been importing electricity and fuel.